Some long ago I recommended an anecdotal travel book to readers by an author called Robin Bryans. 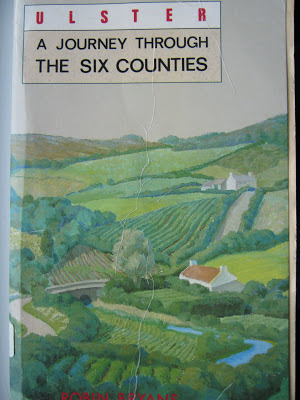 The book is entitled Ulster: A Journey Through The Six Counties. Merely by chance, a regular reader has drawn my attention to the fact that Mr Bryans has a website dedicated to him. Robin Bryans was born in 1928, just off the Newtownards Road in east Belfast, his family moving shortly afterwards to Donegall Avenue. Before becoming a professional writer, he had a variety of jobs including shipyard worker and cabin boy on a dredger. He was later to study at Barry Religious College in Wales and went to Canada as a missionary. Later, in Canada, he lived as a trapper. During the 1960s and early 1970s, his output was prolific. Published by Faber and Faber and acclaimed by critics worldwide, he embarked on a series of travel books celebrating Iceland (1960), Denmark (1961), Brazil (1962), the Azores (1963), Malta (1966) and Trinidad & Tobago (1967). His Ulster: A Journey Through the Six Counties (1962) has long been regarded as a perceptive introduction at a critical moment in the history of Northern Ireland and a classic of the genre. In the same period came the books on which his reputation as a writer rests, the four remarkable volumes of autobiography: No Surrender (1960), Song of Erne (1960) – a vivid and moving account of childhood excursions to Fermanagh. Up Spake the Cabin Boy (1961) and The Protégé (1963) and two volumes of short stories, Tattoo Lily (1961) and The Far World (1962), also from Faber. No Surrender was hailed as the first book by an Ulster Protestant writer from the working class published by an international publishing house to receive national renown. The volumes of autobiography have rarely been out of print since their first publication and are currently available from Blackstaff Press. Selected Stories was published in 1996 by Lagan Press in Belfast, which occasioned a memorable reading in the Old Museum arts centre in his native city. In his later life, Harbinson was dramatically involved in sensational and sometimes scandalous events among the political aristocracy. A riveting account of these and of their parallels among Ulster’s political class from the 1940s until the 1960s can be read in his last three books The Dust Has Never Settled (1992), Let the Petals Fall (1993) and Checkmate, all from Honeyford Press under his own name of Robin Bryans. A courteous, witty and gentle man, Robin Bryans’ last years were spent in London where, in addition to writing, he was involved in a school of music set up particularly to encourage the work of young composers. He died at his home in London on Saturday, June 11, 2005. First published in April, 2012.